A debate with the President of the Council, Donald Tusk, on the situation of the European Union from the point of view of the regions and cities as well as a debate on the current situation in Catalonia were in the focus at the plenary meeting of the Committee of the Regions (CoR) in Brussels on 11th of October 2017. Discussions of various opinions were at the center of the debates. 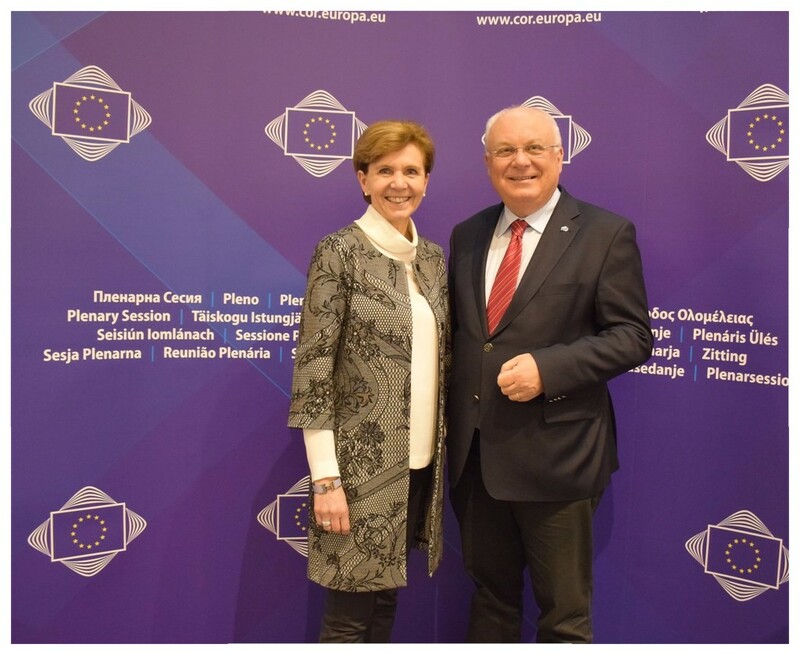 Salzburg was represented in the EU Regional Council by Franz Schausberger and Landtag President Brigitta Pallauf. Franz Schausberger demanded a disarmament of the words from the conflict parties in Spain, a return to the negotiating table and the beginning of a dialogue which could only be a peaceful political solution in the end. In a situation such as it currently exists in Catalonia, there is never a single fault. It cannot be satisfactorily solved either by constitutional violations or by force, nor by threats of the takeover of power by the central authority. The negotiations should ultimately lead to a strengthening of the autonomy of Catalonia, as it had already been decided by the Spanish Parliament in 2006 and eliminated again in 2010. Only this could lead to that all Catalans seeing their future in Spain and not in their independence. President of the Landtag Brigitta Pallauf emphasized at the plenary session in Brussels how important the regions and their involvement in Europe were. The Committee of the Regions dealt, inter alia, with an opinion on the Connecting Europe Facility (CEF), which introduced a new infrastructure financing instrument for transport, telecommunications and energy. After reductions, 24.5 billion euro are available for investments in the transport sector, with more than eleven billion of which are reserved for cohesion countries, i.e. Member States, where per capita gross national income is below 90 percent of the EU Community average. Money is available for transport projects to eliminate bottlenecks, establishing missing links and expanding cross-border sections, ensuring long term viable and efficient transport systems and optimizing the interconnection of the various modes of transport, improving the interrelationship of transport services and safeguarding the transport sector access to transport infrastructure. The CoR calls for a better integration of the regions. So far, EU grants totaling more than 700 million Euros have been awarded for Austrian transport projects, which account for about 94 percent of the rail infrastructure area, in particular the Brenner basin tunnel and the Koralm railway. In addition, comments on traffic issues, the monitoring of environmental requirements, the financing of climate protection, the development of a European data management system, the protection of minor migrants and the European Semester 2017 were discussed.